There are many different types of vinyl flooring ranging from thin domestic sheeting to much thicker industrial grade vinyl. The various types of vinyl will be laid in various ways depending on the sub-floor. If concrete subfloor: a topping or feather coat is applied to ensure the slab is smooth. Then the vinyl is glued down to the topping ensuring a hard bonded finish. If timber subfloor: the vinyl may be glued directly to the timber flooring or laid on a Masonite underlay. Some vinyl may even be loose laid over timber flooring. CAUTION: In older buildings pre 1980, Vinyl may contain Asbestos, this vinyl needs to be tested prior to removal and the appropriate precautions taken. 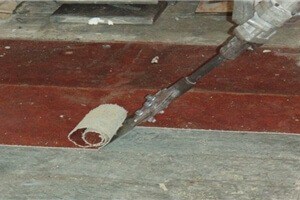 Vinyl removal involves using a specially designed blade and jackhammer to separate the floor covering from the sub floor. Once the vinyl is lifted off concrete a glue resin will be left this needs to be ground off using a specialized diamond concrete grinder. When removed off timber, the timber subfloor will need to be sanded using a timber sander to remove the vinyl glue. NOTE: When removing vinyl from timber subfloor, damage will result to the timber subfloor due to the hard bond between the vinyl glue and the timber.